I must tell you about the mind. It has an agenda. I noticed this so clearly today. I attended a yoga charity event in Arlington, Texas at the Dallas Cowboys Stadium. At least 150 people laid their mats upon the football field, and Tom led the huge group in an intense yoga class. At some point, I could not raise the arms over my head, and sweat was pouring down my face. During the asanas, the mind kept going back to the thought that it needed to network with others...to find someone who would be interested in hosting satsang...to make it a "worthwhile" trip. So the mind was not fully concentrated on the asanas. After the asanas, I watched the Bhakti House Band concert, and suddenly the mind slipped into a deep meditation. For a while, it gave up the agenda and relaxed. I wondered, "What am I for?" Why does the mind always need to have a reason for doing things? Why can't it just rest and relax just for the sake of being? In a deeper meditation, I found myself offering assistance after the band had completed the concert. I had totally forgotten to fulfill my fantasy - meeting lots of yoga teachers and creating connections. Instead I enjoyed breaking down the band's stage. Finally, I was really enjoying something! It is fun to notice the agenda of the mind. Once the agenda is seen, it can be surrendered or at least relaxed. Then a more natural action comes forth, an action of service and love. Who says we need a reason to do things? I visited Amma this past weekend in Dallas. The weekend was quite intense. No one to travel with. No one to room with. Not much sleep. Magically, I ended up with 3 roommates, sleeping on a full bed. Although I was not able to get a hug token, one came to me by chance. Although I came with no one, a number of friends appeared. In the wee hours of the morning, I was working in the kitchen, cleaning off huge dishes. Those folks in the kitchen, hidden away from the main hall, are the unsung heroes, tirelessly keeping the kitchen running smoothly. I met Mani from Tulsa, Oklahoma on the 2nd day. His wife and 3 children were there. He taught me about faith, also called "sraddha." After meeting Amma, Mani experienced a series of synchronous events that he attributed to Amma's Grace. Through his trust in Amma's Grace, he lives in such Joy and enthusiasm. I am uplifted by his positivity. Indeed, I cannot help but smile, thinking of absolutely everything as the Will of the Guru. Floating on a river of Grace, I feel very excited to see what unfolds in life. Like a good book. The book of Brian has already been written. Thank you for your example, Mani. Let's read on and see what happens. I spent a lot of time in a particular town, holding satsangs almost every other day, and the gatherings were growing. So much enthusiasm about the Truth! Perhaps one day, I could settle in such a place. One person in particular really spread the word through her passionate interest in the teachings. She housed me, fed me, and invited so many people to join in these satsangs. At the end of my stay, we parted in tears of gratitude, and I drove away to the next stage of the journey, promising to return to do it again. Recently I discovered that she had moved on and no longer wanted to be a part of it. My reaction is multi-dimensional. Did I do something wrong? Perhaps I had not reached out enough after my departure. Perhaps I had abandoned her. This is so mysterious. Why did this happen? Then another fearful feeling... I was attached to finding a place to settle where people are excited about Truth. Would this ever happen? Or perhaps, all of the gardens would die away, and I would have no place to go. Would all my work be for nothing? Perhaps I had not made a lasting impact anywhere. I have given up my previous life, and now I have nothing. No material things, no enduring satsang communities, no place to live... What is left of my life? Realization came into my mind. My purpose is not to find a place to settle and set up an ashram. It is only to share the Energy with others. Friendships are never permanent, no matter how deep the connection. Ultimately this body is going to pass on. As one door closes, another one is revealed where I may be of more service. And finally, these satsang gardens are not mine nor I am responsible for the crowds of people that come. It is only the flow of the Energy. I must let go and surrender everything to the Divine Movement. Everything happens for the highest good. And finally, I am trying the best I can. I am ready to learn from my mistakes. I don't know how to be a good friend. Please teach me, Mother Maya. Whatever you want, I am at Your service. How does one develop Love and Devotion? There is one simple answer: by dedicating all of one's actions, thoughts and materials to the Lord. Swamiji is the embodiment of the Truth. By honoring Him, we honor our True Self - the One - the Infinite Being. The satsangs I hold are not mine. I don't know how the words come to my mouth nor do I know how the Energy manifests. I only know that I love Swamiji, and He takes care of the rest. So when we are in satsang, it is a powerful spiritual practice to put up a picture of Him, light a candle, burn some incense, and offer flowers. 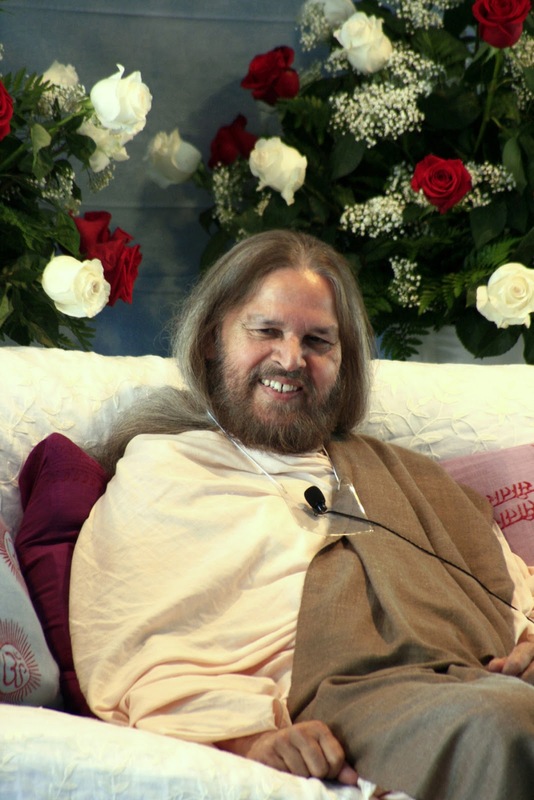 By honoring Him, we honor our Self, and our experience of satsang will be so much deeper. Our hearts open to this Holy event, and our meditations become profound. Let us honor our Soul. Let us show our Love. And as we express our gratitude, we return to the Source from whence we came.